Brad was tired of his growing belly. In the last months and years, his leather belt was being cinched on larger and larger holes. He wasn’t overly out of shape – 5’10” and 180 lbs – but he no longer felt proud of the body staring back at him in the mirror. It was December of 2015. Brad was about to embark on a 10-month journey that would see him use 7 steps to radically transform his mindset and body. Losing weight is a particular challenge for people like Brad over the age of 40 years. In Part 1 of this series, we looked at some of the medical reasons why middle-aged men and women gain weight. A common condition known as somatopause explains how your body reduces its production of Human Growth Hormone (HGH) and makes you pack on the pounds. Step 1. Find your motivation and make the conscious decision to change. It starts simple…but take this first step very seriously. Don’t fall into a common trap by saying something like, “My diet will start Monday!” Instead, take a frank look at your body and imagine how you’d like to change. Set a goal that is “SMART.” This means your goal should be very Specific, Measureable, Attainable, Relevant, and Time Sensitive. Next, ask yourself why you want to make this change. Maybe you want to lose weight so you can be healthy longer for your kids or grandkids. Maybe you want to look better for your spouse. Maybe you just want to feel healthier and more energized. Hold tight to this motivation. Write these goals and motivations down on a sheet of paper. Hang them somewhere where you’ll see them every day so they can be a constant reminder of why you’re making this change. This will help you later when your initial enthusiasm has started to wane. Step 2. Hire a personal trainer. Seriously…it makes a HUGE difference! Many readers will balk at this next recommendation, but take a second and hear us out. Brad faithfully exercised with his trainer four days a week. She guided him through workouts, recommended a healthy diet, and pushed him when he wanted to quit. Step 3. Create a diet plan filled with healthy and delicious foods that you will enjoy eating. Along with creating an exercise routine to help you burn calories and build muscle, you need to make a food plan that will be both healthy and sustainable. He doesn’t eat tasteless ‘diet’ foods that help him lose weight for the short term. Instead, he views his new eating style as a complete lifestyle change. He focuses on clean and delicious ingredients with simple preparation techniques. Eating properly is absolutely key to making a change in your body. Brad feels that if you aren’t committed to proper eating, you should save yourself the time and energy of working out at the gym. One won’t work without the other! Eating right is 90% of getting in shape. – Eat 5-6 small meals a day. This may feel like a lot at first, but as you lose weight and gain muscle you’ll find yourself hungry enough to eat like this throughout the day. – Prepare your own meals when possible. Do your own grocery shopping and cook your own food instead of relying on restaurants. Stay stocked up on groceries that fit your lifestyle. – Stick to clean foods and avoid processed products. These clean foods are most often found around the perimeter of the grocery store. Brad, who is a husband and father of four, had to drastically change his eating habits in order to follow his personal trainer’s recommendations. It was very difficult at first, but he eventually fell into a routine that worked well with his busy schedule. – Breakfast: 1 whole egg, 5 egg whites, one slice of Ezekiel bread. 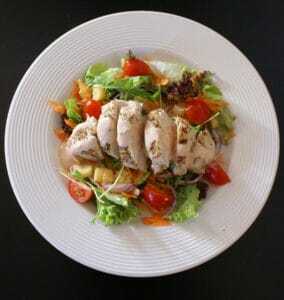 – Afternoon Meal at 2:00pm: Fish/chicken/pork along with a green and/or carb. – Pre-Workout at 3:00pm: Chocolate protein shake. – WORKOUT: 30 minutes with my trainer, then normally 45 min-1 hour by myself doing cardo/abs/various exercises. – Dinner at 5:30pm: Fish/chicken/pork/turkey and a green. Sometimes a sweet potato. He drinks water for most of his meals, has one cup of coffee in the morning, and occasionally indulges in a glass of wine at night. On weekends, he may have a steak or enjoy pizza as a cheat meal. Step 4. Prepare yourself for social situations. Stay strong and stick to your meal plan. 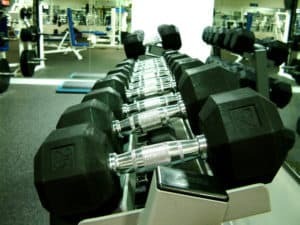 Once you’ve established a workout routine and eating plan, it is time to think about the types of situations that could derail your progress. Brad found that visiting a friend’s house for dinner or a party could be a huge problem. 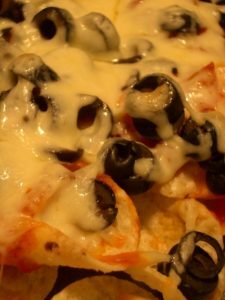 To combat this problem, you may find it helpful to eat on your own before attending a party so you are not as tempted by an unhealthy selection of foods. If you are going to a restaurant with friends, try to look at the menu online before you go so you can find some healthy options. That way, you will be less likely to make an impulse decision to order the extra cheesy nachos with everyone else. Talk to your family about your new eating style and try to get them on board. Having their support and understanding will make it much easier to stick to your plan and make healthy decisions day-to-day. If they are willing to give your eating style a try, then all the better! Step 5. Set goals and track your progress. It’ll be worth it when you can ‘see’ your results. It has long been known that people who track their progress are much more likely to stick with an exercise program. Brad’s personal trainer insisted that he take pictures throughout his fitness journey. 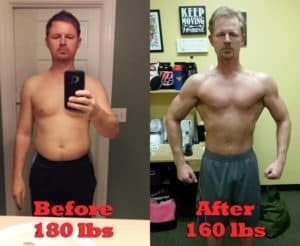 “My trainer kept telling me to take pictures, take pictures…so I did.” Now these photos show his progress as his weight decreased from 180…to 175…to 170… down to his current 160 lbs. The images also show an impressive increase in his muscle tone. He describes his abs as ‘rock hard’ and is proud to show off his new physique. Step 6. Find an accountability partner or get your family on board. When Brad first began this journey he was on his own in the kitchen. Overtime, the rest of his family started to take notice. If you find someone in your life that can act as a cheerleader, your weight loss will be much easier. Talk to your family about your goals, motivation, and your new plan. Ask for their support and you will have a much more enjoyable journey. Step 7. Be patient. Change takes time. Brad’s journey began in December of 2015. During that first month, he struggled through the Christmas season filled with ‘eating, eating, and more eating’ while he learned about his body’s capabilities with his new exercise routine. 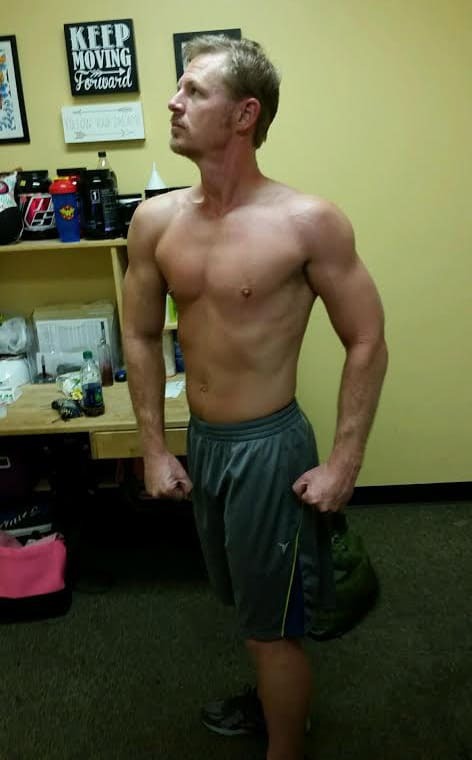 By March of 2016, he began to see noticeable results. His weight slowly moved down while his body packed on muscle and became much more toned. Did you miss the first part of this article? Read part I of this article here. If you need help finding an exercise machine to help you on your fitness journey, be sure to check out some of our treadmill reviews.